I have been a military history, modelling and wargaming enthusiast since I was 8 years old. What a great combination we have in our hobby: endless researching, therapeutic painting, compulsive collecting and strategic thinking. Everyone should do it! It all started when my brother and I were each bought a packet of Airfix 1/72nd plastic figures by a relative back in 1970 – we had hours of fun pitching my US Marines against his WW1 Germans! Auntie Louis has a lot to answer for. From there we progressed to model tanks, and about three years later – after seeing an article in Battle magazine – I played my first real wargame using model tanks and plastic soldiers on a squared grid system. I then found several books by Donald Featherstone and Charles Grant in the local library and made a point of getting them out repeatedly – I was hooked! I discovered the Society of Ancient and WRG when was 11 – first playing 4th edition and most things since. I spent my early teens, collecting micro-armour after my first games of desert tank warfare on the drive of my good friend Mark Bevis (guru on WW2 and all the weird armies of the Napoleonic era and publisher of the MicroMark lists). I was introduced to Napoleonic’s by Tony Dalton (now of the Reading Club) using Bruce Quarrie’s Napoleonic Campaign in Miniature. Since those early days I have played everything from ancient Egypt to Sci-fi, from 1-1 skirmish to massive campaigns, and from historical refights to competition games – and enjoyed them all. I have made some fantastic friends from the hobby, both at clubs (I am often seen at Reigate, Farnborough and Oxford) and on the competition circuit in the UK, and around the world playing in places as far afield as South Africa, America, Greece, Italy, Switzerland and Belgium. I have made friends across the globe through my hobby, and with the wonders of the web and modern communication I feel closer to them than ever. Through the 90s I played a lot of competition games (with the very popular DBM system conceived by Phil Barker), and had some success in the competitions. I was often a competition umpire and creator of competition clarifications for those rules. I started creating rule systems back in the early 1980s. I have always had an interest in game systems and indeed a fair part of my second degree was about game theory (Russell Crowe played its pioneer, and one of my heroes, Professor John Nash in the film “A Beautiful Mind”). This combined with a good grounding in stats and simulations has, I hope, made for a decent basis for rule development. In the 2000s I became a published rule author myself, as one of the inventors and authors of the very popular Field of Glory rule system published by Osprey Publishing/Slitherine. We all owe a great deal of to thank the founding fathers of wargaming – people like Donald Featherstone, Charles Grant, Bruce Quarrie, Phil Barker, Terry Wise, and Phil Bath. As the saying goes we can no “stand on the shoulder of giants” to move our hobby forward in to the modern age. Now I have the opportunity to give something back to the hobby and I hope you all like the results and enjoy them. 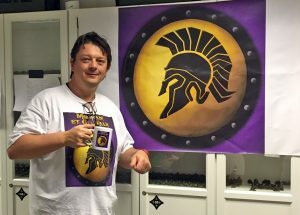 At the end of June 2016 I am retiring from full-time work and have started TheWargamesZone.org as a vehicle for me to develop further rule systems and enhance the community of world wide wargamers. As part of the “retirement” plan we are also moving the family to South Africa where we will be setting up a TWZ Holiday Centre in the sun in Cape Town – more news in 2017. I will be back in the UK about 6 times a year to do what little work I am keeping, but mainly to attend tournaments and shows, and to get some serious gaming in with my friends. I am particularly passionate about trying to get new people into our hobby. We are an ageing niche of table top players yet computer games have 100,000 of youngsters playing with tanks and planes on-line. Whenever and wherever I show such youngsters the tabletop game they are fascinated and interested. The modelling and 3D side of the game still appeal. We need to embrace he new world and encourage as many people as possible to pick up our fine hobby. Indeed we owe it them. Our hobby is fantastic for personal development. I made a career as Strategy Consultant for big business, to this day I am convinced it is my hobby – started so young – that led to this success. Mortem et Gloriam is the first of a series of wargames rules I will be releasing over the coming years. I have been mulling over ideas for various rules for a good 20 years but never had time to develop them fully. Now I do. Mortem et Gloriam came out on July 1st 2016 and is growing rapidly – well over 1200 players. Small army variants are out Jan 2018. WW2 is out 2019. Renaissance 2020. Napoleonics 2021. A special thanks to my play testing team who have provided invaluable input and tested the rules in all situations ranging from friendly club games to the most rigorous of competition environments. Most recently to those in South Africa joining the group. And to the whole MeG team who have done the most amazing job on 600 army lists. It is so good to have a great team of enthusiasts working together.